Snow keeps plugging my lawnmower. I’m sure you can guess what happened last night. That which should not be named came down again and it’s been seen on and off all day. Thankfully it’s been confined to the higher elevations but I suspect tonight we will lose the magnolias to even stronger cold. Spring is on the calendar though, and after an explosion of growth last weekend this cooler weather has brought things back down to a more considerate rate. Daffodil ‘Golden Echo’, white hyacinths, and a winter-burned variegated boxwood make for an unusually (for my garden) subtle combination. Corydalis ‘George Baker’ still looking good in spite of downpour, heat, cold, and frost. This clump is overdue for division and thanks to Facebook and trading I’m pleased to say I know exactly what to do with all the extras! Corydalis solida ‘Harkov’. Nice enough, but maybe too subtle for me. To its credit ‘Harkov’ does have decent sized bloom heads and seems to be growing fine, but the color reminds me of a previously poo-pooed bunch of what I bought as straight corydalis solida. The species has been a bit of a weak grower for me with small blooms and a color I first thought of as washed out, but this year I kind of like it. I kind of like all my corydalis this spring and maybe it would be a good idea to get many more. This patch could easily use some white blooming friends, no? Corydalis solida in need of companion colors. Maybe a few of the native white blooming dicentra Canadensis (squirrel corn) would fit the bill. The corydalis are such an easy grower, anywhere they can rest in peace during their summer dormancy seems to suit them just fine (although they are said to prefer a woodland setting). Another easy grower which I’ve really taken a liking to are these multiflowering ‘Anastacia’ hyacinths. They get transplanted and divided frequently as I accidentally dig up the bulbs, but other than that nothing much gets done. I suspect the summer dryness of this bed goes a long way in keeping them happy. ‘Anastacia’ is from a strain of Dutch hyacinth which naturally produce multiple, looser flowerheads than the big fat, single stalk Dutch hyacinths one typically sees. The color is great, but the dark stems seal the deal for me. I like how the hyacinths combine with the blue fescue. Just recently I was considering evicting the fescue completely, but this week I’ve flip-flopped, and might just divide it all up and put an even wider border of it all along this bed! 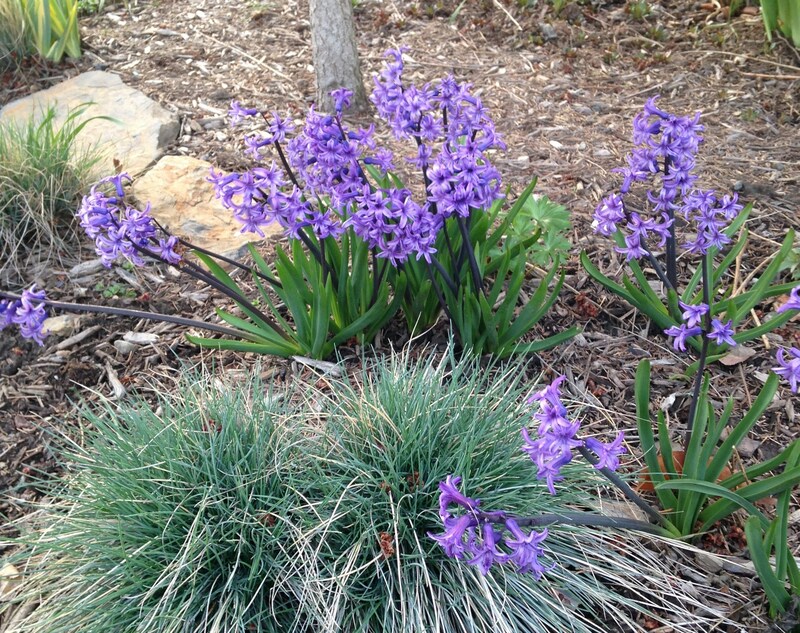 Blue hyacinths with a pair of ready-to-divide fescue clumps. I see dozens of divisions here, enough to fill in a whole new edging scheme! There’s plenty more going on in the garden, but between work, baseball games, dance and spring cleanup (and all those garden strolls) I don’t get on the computer as much as I’d like or snap as many garden pictures as I should. Posting and keeping up with the other blogs which I enjoy will have to wait, but I’m sure any gardener will understand. Muddy and tired are the sign of the season! The early narcissus are starting. This old double (pre 1927) is narcissus ‘Feu de Joie’. So I’ll keep plodding along. Hopefully the snow will leave for the season, the lawn will dry out enough to mow, and the gardener will have a good weekend. Scratch that. It’s April and I know I’ll have a good weekend. Hopefully you will as well! This entry was posted in daffodils, early spring, spring bulbs and tagged corydalis solida, flowers, garden, spring, spring bulbs. ← Were those snowdrops all just a dream? Looking good! We had some unmentionable today, too. 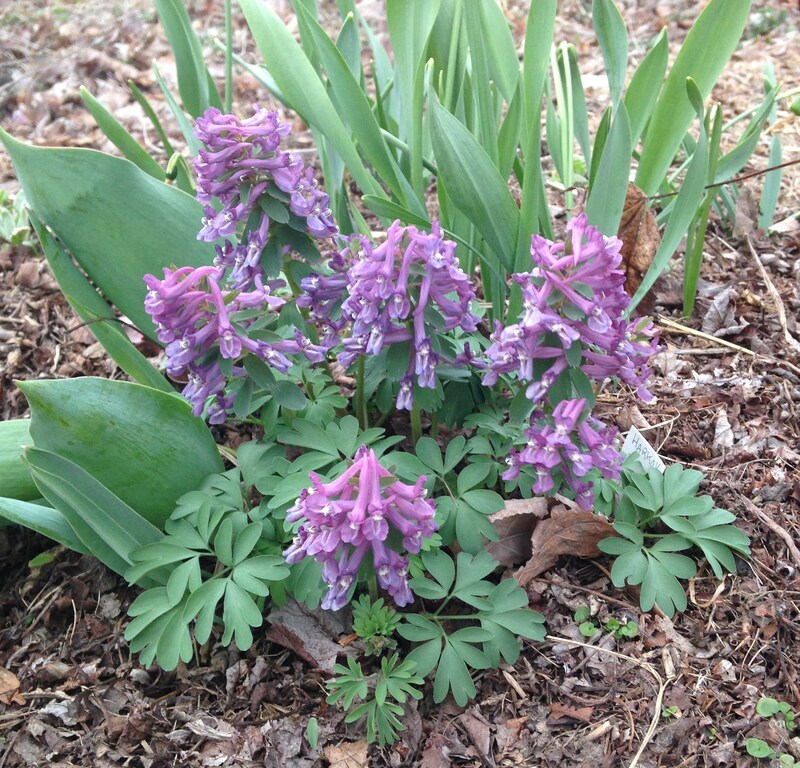 Corydalis are just thinking about blooming here. As I always my garden is behind yours. Your garden is so much colder than mine. I know this because I can just click on your weather station and immediately know for sure how smug I should feel! 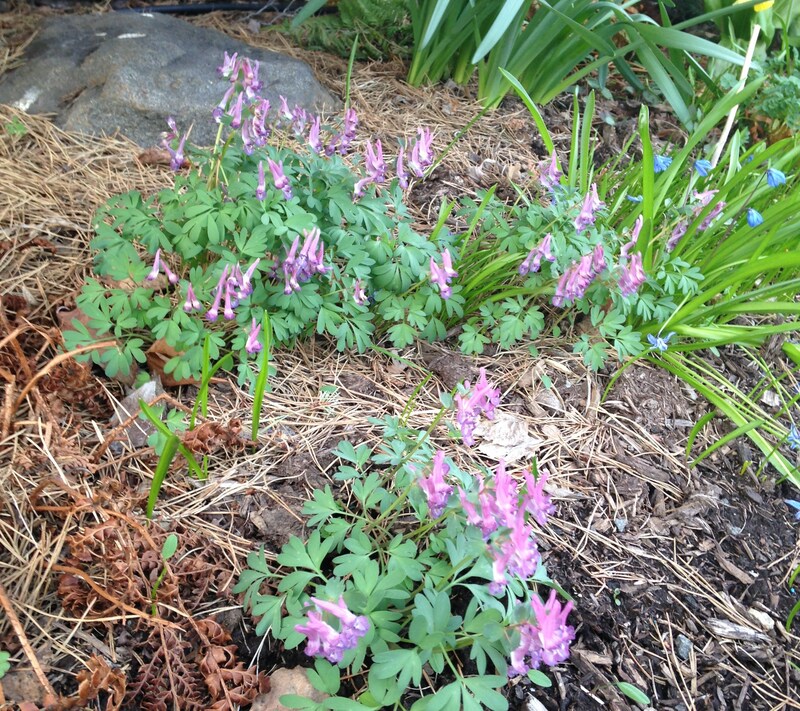 Do you have corydalis? I forgot. Bittster, if you plant a yellow item alongside the purple corydalis it will intensify the color. Maybe some Tete a Tete daffs? I’ll try that Paula. It’s an interesting color but gets slightly lost in the leaf mulch. Maybe a different spot wouldn’t be the worst idea either, but it seems to be settling in nicely so until it multiplies some more…. I do have some Tete a Tete which need dividing. Love the title of this post! I really like that purple Corydalis… similar to the wild Corydalis cava that grows around here on damp ground near the river but comes in shades of pinky purple too, and creamy yellow/white. More Corydalis can only be good! Have a great weekend! Hope your weekend was nice as well! I think I found a source for the c. cava. I’ve been avoiding everything other than solida because I thought they were either difficult or weedy. I’ll have my stinzenplanzen before you know it! I feel for you, it must be so frustrating to have yet more of the white stuff. I do hope your magnolia survives the low temperatures. Love all your corydalis, they are such lovely colours. Thanks Pauline! The magnolias were fine overnight yet some lily seedlings did not fare well. I can’t figure it out…. I can’t believe the heavens are throwing more white stuff your way. Sheesh…I do hope your Magnolia is OK. The narcissus are absolutely stunning. That old double is certainly superb! 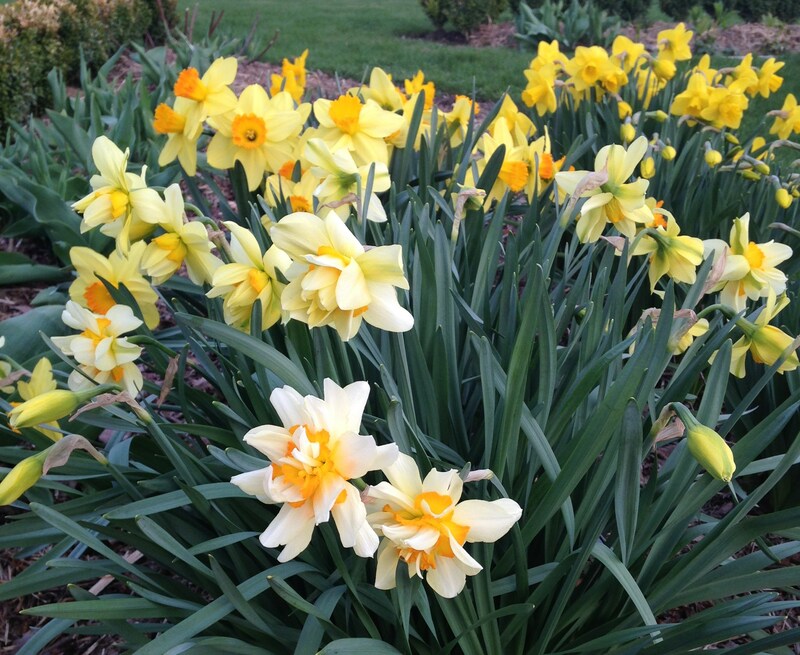 I’m not the biggest fan of double daffodils, but this one is easy and reliable… makes me forget its floppiness! You have some pretties to enjoy now at last despite the snow. I like the Hyacinth, it is so much prettier than the big fat ones. Corydalis are a favourite of mine, I love the way they seed about and you never know how their children will turn out. Have a lovely gardening weekend. Hope you had a lovely garden weekend as well… and a nice glass of wine to take the edge off the aching muscles! I have several corydalis seedlings which are coming along nicely. I’m curious as to what I’ll see once they bloom. My fingers are crossed for next year, but I suspect it will take one more after that before I see anything. It’s always nice to have these little things coming along. Ouch, and I was complaining about last night’s frost, but to think you got snow… AGAIN… ! “oldest and rarest” I didn’t know that! I looked around at Old House and saw a few I have. Let me know when you’re ready for your “permanent” garden and I’m sure I can spare a few and avoid any threats of cardiac arrest! Glad to see you are catching up with us. But I am sorry about the return of the stuff that cannot be named. Yeah… but it’s always a surprise how little damage a late light snow will do. Much preferred over a strong cold snap or hard May frost. 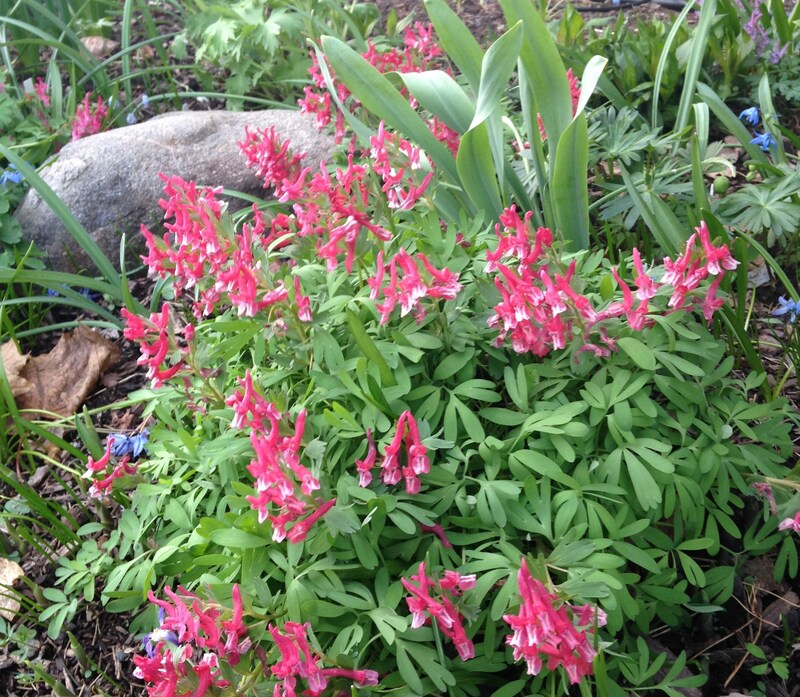 I hope to divide the corydalis this year so let me know if you’re interested in a few. My daughter came home and told me her English class decided it was confetti falling from the sky to celebrate Shakespeare’s birthday! My poor son had a track meet yesterday afternoon at Wallenpaupack, with the wind blowing off the lake right up onto the track. I, being a fair-weather track mom, did not go (and of course he had his best meet of the season, winning the 110 hurdles.). The good news is that nothing in the garden seems any the worse for the wear. I don’t know why I’ve never considered growing Corydalis. PS It looks like I’m going to have to plan to ride in with my husband and daughter when they go to the skating rink sometime soon so I can see all of your daffs live and in person! I remember having to explain to a freshman this past swim season that the Paupack team does not practice in the lake. You would think this would be a given considering he asked in mid January…. I was expecting a call this weekend! Next weekend should have most of the daffodils open so let me know if you’ll be around. And yes, I’ll keep a visit to the valley in mind for next weekend! Nice selection so far Frank. I am resorting to last year images because we are still stuck a bit with below freezing temps. Snow here too. I traveled around and nowhere else in our area has anything to speak of in bloom. I guess I will be happy when everything is blooming at once! Spring will come. At least I’m pretty sure it will. Though it’s likely you’ll be showing off tulips and daffodils at the blogger’s fling! The snow missed us, but last week was unseasonably cold on most days. 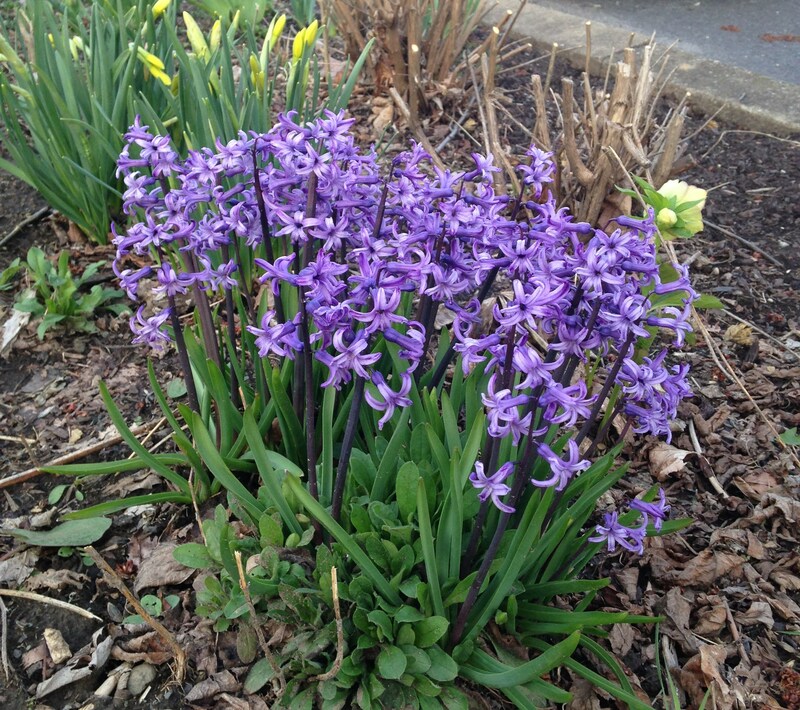 I really like those ‘Anastasiya’ Hyacinths. Right now I’ve got a yellow Hyacinth, ‘City of Harlem’. I’m enjoying it, but next year I may give ‘Anastasiya’ a try. It’s funny isn’t it? I always keep this list of so many new things I want to try but then the catalogs come and trick me into something completely different. It all works out in May though, I never feel disappointed when I see a new bulb bloom. Spring is easing toward your direction. 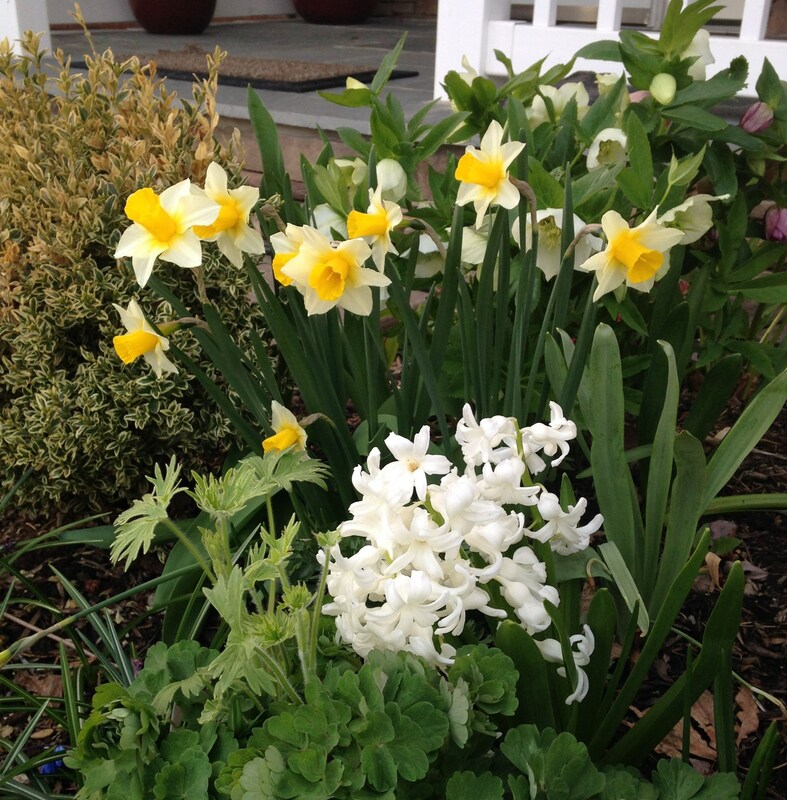 Love those daffodils and hyacinths. Thanks Susie. Seems like you were posting daffodil pictures months ago! You’ve just got to get some warmth soon, it’s definitely time. I was so fed up a few weeks ago I had to head south for a snow-free day trip! I’ll have to take a second look at corydalis elata (assuming I took a first look!) I’ve heard so many sad tales of blue corydalis dying of heat fatigue I just look away whenever one comes close… but I just saw during a quick search that c. elata is supposed to be more heat resistant, looks like one more for the wish list! ‘Anastacia’ is gorgeous, I was hoping my hyacinths might break into multiple heads after being in the ground a couple of years but no, one strong rigid head is what they produce. I must look out for these. You may have better luck finding a nice multiblooming one, I haven’t had much success. Here there is a white, powder blue, and baby pink (the Festival series) and I’m not all that keen on any of those. What I would love would be a dark purple!